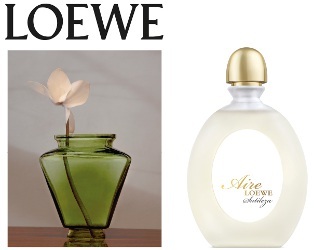 Spanish house Loewe has launched Aire Loewe Sutileza, a new perfume for women. Aire Sutileza is a flanker to 1985's Aire Loewe. The most floral and delicate interpretation of AIRE LOEWE. A fresh and floral Eau de Toilette with a marked citrus head characterized by notes of Calabrian mandarin and pear. It follows a subtle and elegant heart thanks to a bouquet of white flowers. Inspired by the lightness of the air and the serenity of the AIRE LOEWE woman. Additional notes feature blackcurrant, jasmine, lily of the valley, magnolia, musk, sandalwood and vetiver. Loewe Aire Sutileza is available in 75 and 125 ml Eau de Toilette.